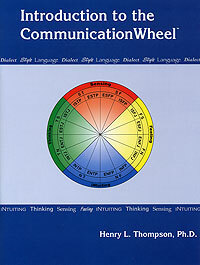 Introduction to the CommunicationWheel® is based on the CommunicationWheel System developed by Henry L. Thompson, Ph.D. Beginning with an excellent overview of communication and Type languages, it also includes detailed descriptions of the 4 languages, 8 dialects and 16 styles in easy-to-read table format. Also included is a communication style portrait for each of the sixteen psychological Types. The CommunicationWheel is a powerful tool for the Type practitioner as well as a helpful take-away for MBTI training. A complete trainer's manual. Includes step-by-step outline with lecturette, reproducible masters, over 70 PowerPoint instructional overheads, application exercises, Communication Preference Questionnaire™ and a bibliography/resource list.